in Pineville, Florida share their inventions with family, friends, teachers, and coaches. The purpose of Inner-City Arts' Creativity Labs in downtown Los Angeles was to encourage students to pursue tasks and design challenges using creative thinking and creative problem solving. The Labs sought to stretch students' thinking skills relevant to creative thinking, and just as importantly, to boost their motivations to pursue their goals creatively. CRoC used guided, systematic observations, student surveys, and student journals to assess the Lab during its pilot year and for one subsequent Lab. The students in the Lab, who came with their teachers from 4th grade classrooms nearby, were lively, engaged, and happy. They worked in pairs, groups, and alone and had that flexibility within and across projects. Students interacted fluidly with the lead instructor, assistants, and their classroom teachers. The Labs were energetic, fun, visually delightful, and stimulating contributors to language learning, which is in stark contrast to many traditional classrooms. 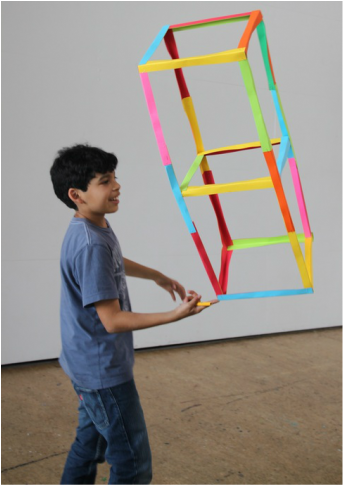 A student in the Inner-City Arts Creativity Lab dances with his marble run in progress. ​CRoC engaged in three distinct projects with P.S. Arts based in Venice, CA. Two were research studies and the third was a narrative history of the organization. The focus of the first study was the development of creative skills and competencies in 4th grade students in six elementary schools in the Lawndale Unified School District from the beginning of SY 2012-13 until the end of SY 2013-14. The second study took place in five elementary schools in the Reef-Sunset School District and the Wasco Union School District in California's Central Valley. The focus was to assess the impacts of P.S. Arts Classroom Studio in-school program (Reef-Sunset) and Extended Learning after-school program (Wasco) on children's development of creative skills and orientations. The third project engaged CRoC in the narrative documentation of the organization's history, commissioned by the Herb Alpert Foundation.